After nearly a year of teasing, Razer's Nabu smartband will try to find its place in a crowded wearable market on December 2. The Nabu will cost $100 through Razer's online shop, and will be available in North America at first, with other regions to follow. The Nabu also has an accelerometer for measuring steps taken, active minutes, calories burned, and time slept, and it can integrate with Apple's Health app on iOS devices. The hardware is splash-resistant, but not fully waterproof, and lasts for up to seven days on a charge. 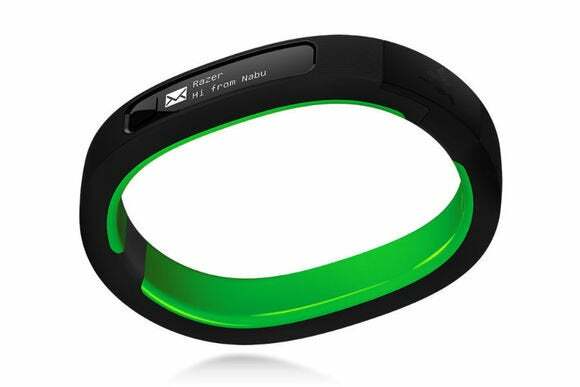 But the Nabu's most intriguing feature is its ability to communicate with other Nabu wristbands. Users can exchange contact information by tapping their bands together, and a proprietary wireless system allows two bands to connect from further distances. For example, Nabu users might get an alert when another user of Steam's PC gaming service is nearby. Of course, this feature is entirely dependent on developer support, so it's best not to get too excited until Razer releases a list of actual apps that will be available. Why this matters: Razer is entering the game amid plenty of competition. Jawbone and Fitbit recently refreshed their fitness band lineup, and cheaper alternatives abound from companies like Misfit. Microsoft has also entered the fray, and a growing number of Android Wear smartwatches have hit the market over the last couple of months. The Nabu may still hit a sweet spot for users who want discreet notifications and fitness tracking without spending more than $100, but it won't really stand out unless it manages to snag lots of interesting third-party apps.